Beyond Bamburgh and the tidal estuary-like mud flats of Budle Bay, is Holy Island, still often known by its more ancient name of Lindisfarne. It is only accessible from the mainland at low tide by means of a causeway, which can be reached from the village of Beal. We have a wide collection of pictures ands prints of Lindisfarne Holy Island. To the south of the more modern road surface causeway, a series of stakes mark the old route across to the island called the `Pilgrims Way' which was used in ancient times by visitors to the great Christian centre of Lindisfarne. Again this could be crossed only at low tide. Our on-line collection of Lindisfarne Holy Island singned prints & pictures is probably the internet's most comprehensive. In 654 Cuthbert came to Lindisfarne, where his reputed gift of healing and legendary ability to work miracles, achieved far reaching fame for the island. 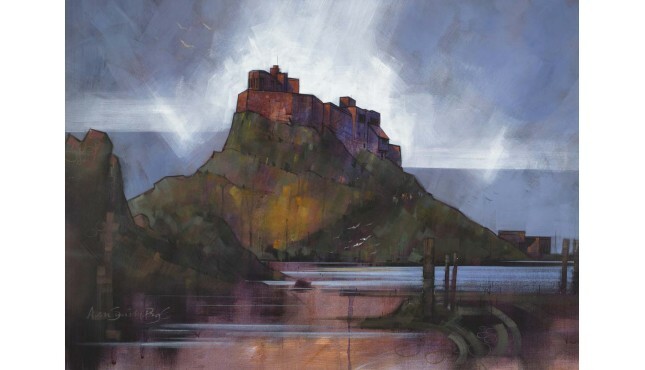 Cuthbert was elected Bishop of Hexham in 684 A.D but exchanged the see for Lindisfarne, to become the fifth successor to Bishop Aidan.When Cuthbert died in 687 A.D, he was buried in accordance with his wishes on the island of Lindisfarne, but eleven years after his death, his body was found to be in an incorrupt state by the astonished monks of the island. The monks were now convinced that Cuthbert was a saint and pilgrims continued to flock to Lindisfarne in numbers as great as during Cuthbert's lifetime. A beautiful sunrise on the Northumbrian coast with the usual threat of rainAlso known by its..
HOLY ISLAND, LINDISFARNE, NORTHUMBERLAND Also known by its Celtic name as Lindisfarne, Holy Islan..
HOLY ISLAND, LINDISFARNE, NORTHUMBERLAND, UPTURNED BOAT AND CASTLEI spent the whole day on H..
Holy Island/Lindisfarne is such a captivating subject that I keep coming back to find new inspira..
HOLY ISLAND, LINDISFARNE, NORTHUMBERLANDI spent the whole day on Holy Island photographing d..